Home students corner Congenital Adrenal Hyperplasia (CAH) – Diagnosis! Congenital Adrenal Hyperplasia is an uncommon cause of hypertension in young patients. 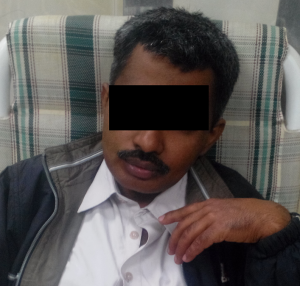 This 32-year-old patient, unmarried, and a watchman by profession was referred to the PIMS surgery department for resection of an abdominal mass. The abdominal mass was investigated during his previous admissions and a laparoscopic biopsy was done which was consistent with the diagnosis of myelolipoma. The patient was admitted to the surgical ward and repeatedly scheduled for surgery but his blood pressure would rise to above 200/100 mmHg and would be sent back to the ward. He was under treatment from the cardiology department and was using a calcium channel blocker, beta-blocker, angiotensin receptor blocker, and a diuretic but his blood pressure was never controlled. A medical consult was sought this time. Reviewing his record, he was diagnosed as a case of hypertension since the age of eighteen years. He was admitted multiple times for hypertensive crisis at various tertiary care hospitals. His workup for hyperaldosteronism and pheochromocytoma was repeatedly done but was always negative. The abdominal mass was incidentally picked up on an abdominal ultrasound after which he was referred for surgery. CECT of the abdomen was consistent with the abdominal mass. His laboratory investigations were absolutely normal except for hypernatremia and hypokalemia (on various occasions). Before going on to the investigations which the medical team advised and further discussion, let’s evaluate ourselves first!! What is the possible diagnosis at this stage? What is the abdominal mass? What investigations should be advised to this patient to confirm the diagnosis? Key for the above questions and a brief discussion is posted below. 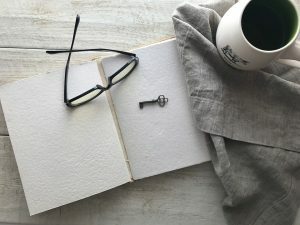 New visitors should try to think and solve the questions prior to looking at the key. 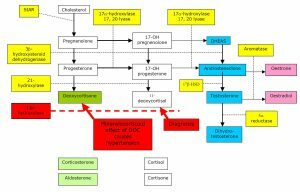 What happened to our patient with congenital adrenal hyperplasia? Our patient was advised a pelvic ultrasound that revealed normal internal genitalia of the females i.e., ovaries and uterus. The patient was also advised 11 deoxycortisol levels but the test was not done because of non-affordability. The patient underwent surgical resection of the tumor and to the surgeons surprise one of the adrenal glands was missing!! The patient was counseled about his disease and that HE IS ACTUALLY A SHE. He was started on dexamethasone 0.5 mg at bedtime and spironolactone. He came for a follow up after a few weeks. His blood pressure was controlled with only spironolactone, electrolytes were normal but the patient refused to take the medicines any further as he complained of breast enlargement. Because he was a watchman at a university, his change in appearance might result in his disqualification from his job. Secondly, he was brought up as a male and gender change at this time was not an easy task, so he discontinued the treatment. 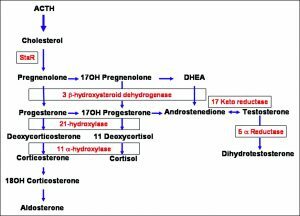 A brief discussion about congenital adrenal hyperplasia and 11 Beta hydroxylase deficiency in specific. With clinical features manifesting in the genital system. The adrenal glands are located above each kidney. Each adrenal gland is made up of two regions, the inner region (called the medulla) which produces adrenaline and the outer region (called the cortex) which produces adrenal steroid hormones. Three types of adrenal steroids are produced; glucocorticoids ( sugar hormones), mineralocorticoids ( salt-water hormones) and androgens (male hormones). the three main hormones produced by the adrenal glands are shown in the diagram above. 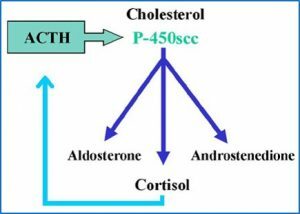 Cortisol is the main hormone inhibiting the production of ACTH. If cortisol production is stopped, ACTH production will increase. Enzymes you must not forget! 11 Beta hydroxylase deficiency which is the second most common cause of adrenal hyperplasia is characterized by hypertension and hypokalemia. 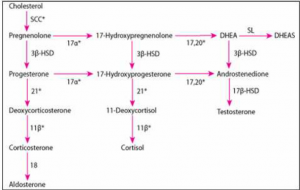 As seen in the flowchart, the deficiency of 11 hydroxylase causes a deficiency of both cortisol and aldosterone. Since cortisol is not synthesized, the negative feedback mechanism controlling ACTH is lost. This results in overproduction of ACTH which stimulates the adrenal gland. The adrenal gland responds by producing more androgens and precursors of cortisol and aldosterone. 11 deoxycorticosterone, a precursor of aldosterone has mineralocorticoid activity resulting in hypertension. Similarly, excessive androgens cause ambiguous genitalia in females and precocious puberty in males. Diagnosis is made by measuring precursors of cortisol and aldosterone, androgens and rarely ACTH stimulation test. Ultrasound of the pelvis to determine the internal genitalia and karyotyping to determine the genotype. Treatment is with steroids, used in the evening, to suppress ACTH and aldosterone receptor antagonists. genital reconstructive surgery may be done to correct the phenotype of the person. Monitoring is necessary to evaluate for steroid overdose or underdosing. Next articleFatty liver increases the risk of liver cancer by ten times!! Upper right abdominal pain and jaundice – Diagnosis? The mass doesnt make sence in relation to the diagnosis though i guess. It might be another problem with the patient. Fatty liver increases the risk of liver cancer by ten times!! Brain dead but alive – Physicians must take extra caution! !.